Any visitor to the Bishop’s House will be hooked right from the time of the charming walk through the circular garden path to the main entrance. Originally, the Bishop’s House was built as the residence of the Portuguese Governor in 1506. After the Dutch conquest in 1663, the building came under their control. With the British invasion, it fell into the hands of the Vernedes family. 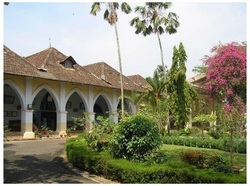 In 1888, Dom Jos Gomes Ferreira, the 27th bishop of the diocese of Kochi acquired it and made it the Bishop’s House. Ferreira was a powerful man and his jurisdiction extended to Burma, Malaya and Ceylon, apart from India. Standing amidst lush greenery with its distinctive large Gothic arches and pillars, the Bishop’s House exudes elegance that is enhanced with each passing century. Though the House has been subjected to many alterations by successive bishops since 1888, the basic structure has not been tampered with. The numerous expansive corridors, living rooms, wooden staircases, stained glass windows, marble plaque near the main staircase and so on have retained their unique charm. Inside the Bishop’s House, there is a series of 36 paintings displayed on the large walls. These paintings depict events in history that led to the formation of Catholic Church in Kerala, right from the arrival of the Portuguese to the establishment and growth of the diocese.